FES International, producer of fluid transfer systems to oil and gas clients across the globe, has successfully secured two new contracts, to supply equipment to projects in Indonesia and Nigeria. The global provider has supplied both projects with its state-of-the-art CALM Buoy Swivels; a sealing and bearing system, fully certified by DNV GL. The swivel technology allows the buoy to fully rotate while maintaining a leak-free joint between the subsea pipelines and vessel, during the transfers of fluids such as oil, LPG and water. The contract for both projects was awarded by Orwell Offshore Consortium. The Balongan upgrade project involves the supply of the turret-type CALM buoy, which will be permanently located in water depths of 26m, off the North-East coast of West Java. The buoy is part of the new SPM system, which is designed to accommodate up to 165,000 DWT vessels and is intended to be used to offload crude oil from tankers to the RU VI storage tanks, for consumption in Indonesia. The Escravos Export System Project (EESP), also sees the supply of the turret-type CALM buoy (two in total), which will become part of a new 30” pipeline, approximately 42km long, which will run from the Escravos Terminal to the 2 off Single Point Mooring (SPM) facilities. The CALM buoys will be permanently located in water depths of up to 30m, and will be part of a new SPM system which is designed to accommodate vessel sizes up to and including VLCCs. The system is intended for loading and unloading between the terminal and offshore tanker, and will be capable of handling up to 30,000 barrels per hour. Managing director of FES International, Rob Anderson, said: “These two new contracts demonstrate that the industry is recognising the many benefits the CALM Buoy Swivel brings to the market. “One of the major advantages of the Calm Buoy Swivel is that it enables the replacement of seals on board without the requirement to bring the main buoy into a repair yard, therefore significantly reducing maintenance downtime and being offline for long periods of time. 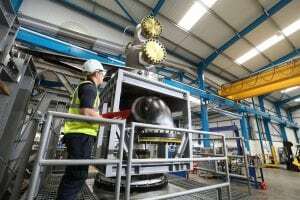 “It also includes a leak detection system complete with instrumentation to allow the user to monitor the seal performance; an integrated pressure transmitter to monitor the pressure during loading; and an integrated electrical slip ring to allow electrical cable connections from subsea to topside. In addition to the CALM Buoy Swivels, FES International is also supplying Chain Stoppers for the Mooring system and hydraulic umbilical for the Balongan project, and Chain Stoppers for the Mooring system, hydraulic / electric umbilical, and process pipework & valves for the CALM buoys, for the Escravos project.